Over the past few weeks I have been sharing some of my experiences from my recent trip to Walt Disney World. 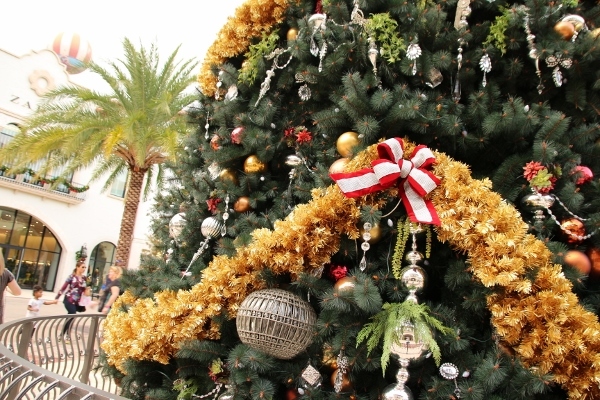 We traveled there during one of the best times to visit, early December when crowd levels are still considerably low, but all the gorgeous Christmas decorations are already up. 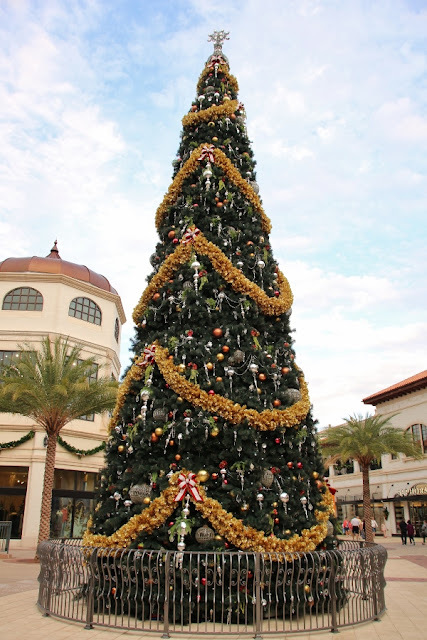 Although Christmas has now come and gone, I'm still happy to share some more photos from the parks, resorts, and in today's case Disney Springs. 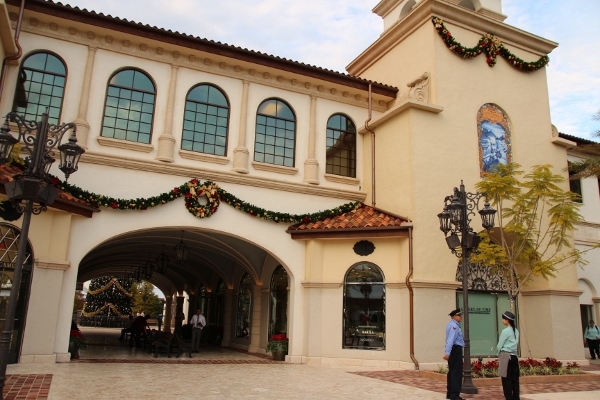 Disney Springs has undergone a huge transformation recently. 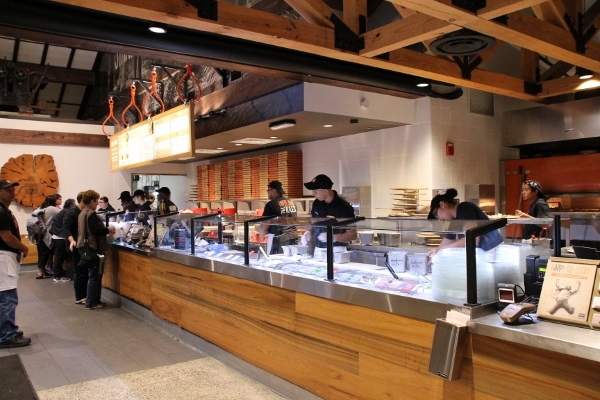 Not only has the name changed from Downtown Disney to Disney Springs, but over the past year there have been tons of new restaurant openings at this shopping center. My wish list of dining spots to try here is quite long (and still growing), and since we never quite manage to spend much time at Disney Springs on any given trip (we typically end up eating at the parks or resorts), I have a feeling it will take many trips before I cross them all off the list. We went back and forth on a couple quick service dining options prior to heading over to Disney Springs late one afternoon. 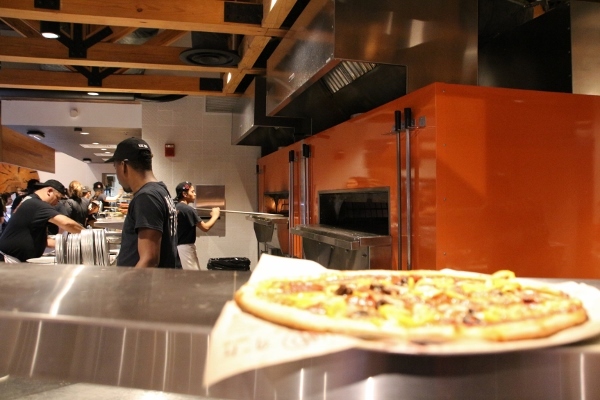 My nephews have some dietary restrictions and are currently avoiding both gluten and dairy, so Blaze Fast-Fire'd Pizza was a great choice since it allows diners to truly customize their 11-inch personal pies. Gluten-free and high-rise crusts are available at an additional charge. 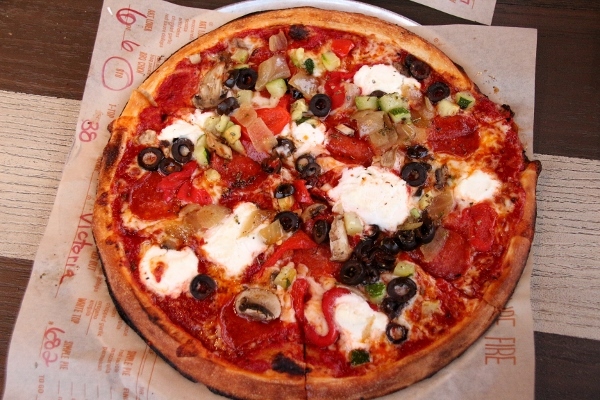 Blaze has several specialty pizzas on their menu, all priced at $9.65. 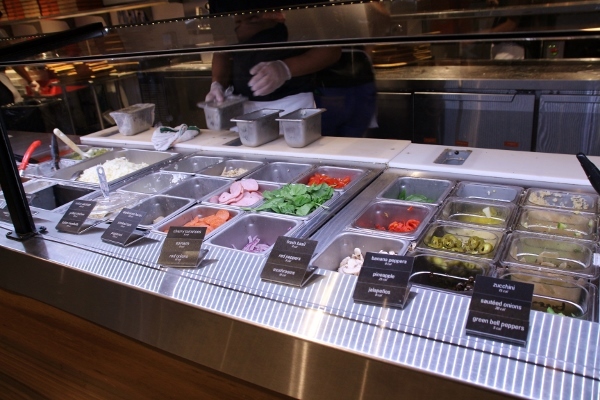 You may customize a 1-topping pizza (sauce, cheese, and 1 topping) for $8.45, or create your own pizza with unlimited toppings for $9.65. That's right folks, you can pretty much create any pizza under the sun for less than $10, unless you are paying to upgrade your crust (that's a $2 surcharge). 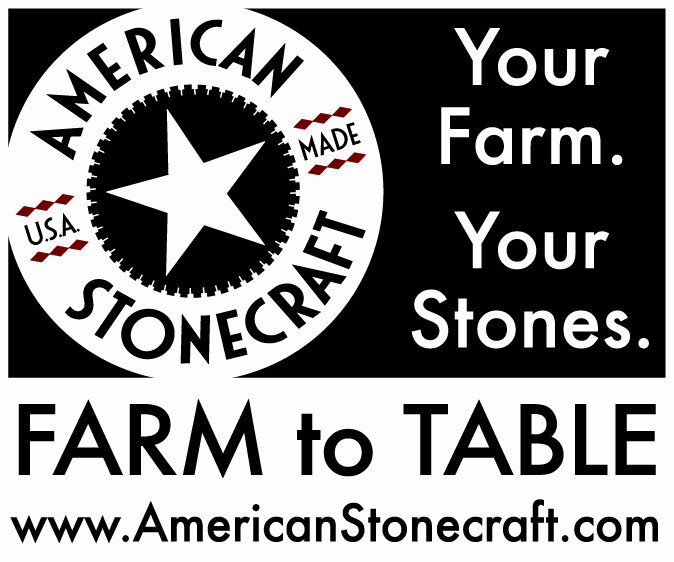 Not only are you able to design a one-of-a-kind artisanal pie just for you, but it cooks in 3 minutes in a super hot pizza oven. 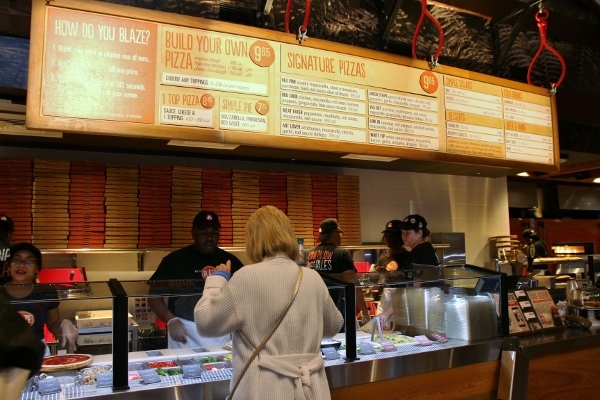 So although the line was literally out the door when we arrived at Blaze, and we ordered 6 completely unique pizzas in our order, our pies came flying out of the oven in mere moments. I was really impressed. For my personal pie, I topped a standard crust with classic tomato sauce, mozzarella and ricotta cheeses, pepperoni, roasted red peppers, mushrooms, olives, sauteed onion, and zucchini. You can also finish your pizza after it comes out of the oven with things like a pesto drizzle or balsamic glaze, although I opted to enjoy mine as is. For a pizza using a pre-made shell and only baking for 3 minutes, I am very happy with the quality of my dinner. 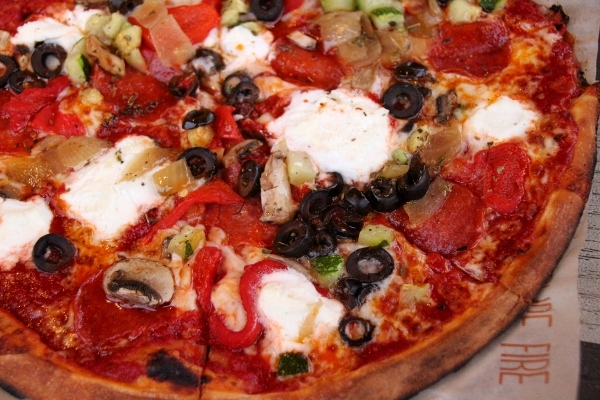 The crust is thin and chewy, the sauce is well-seasoned, and the toppings are excellent. For a cheap, quick meal at Disney Springs, I would definitely recommend Blaze. 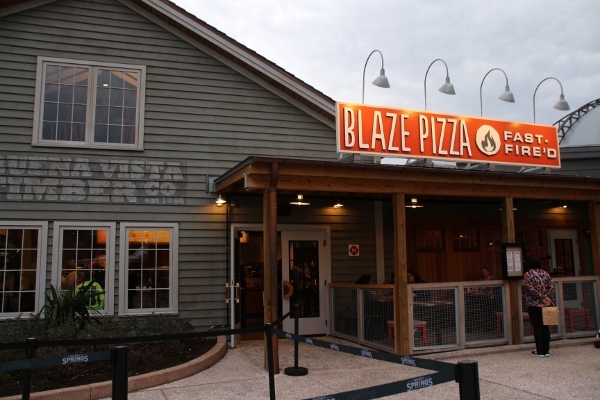 In fact, I even used the locator on their website to see if there are any Blaze locations near me (the closest is an hour away, unfortunately), but I'm excited by this concept and the resulting pizzas are definitely satisfactory.